Pension plans play a key role in maintaining your standard of living in the future. However, delaying the pension planning process can have a dramatic effect. The longer you delay saving into a pension fund, the higher the premium* required to achieve a particular lump sum upon retirement. 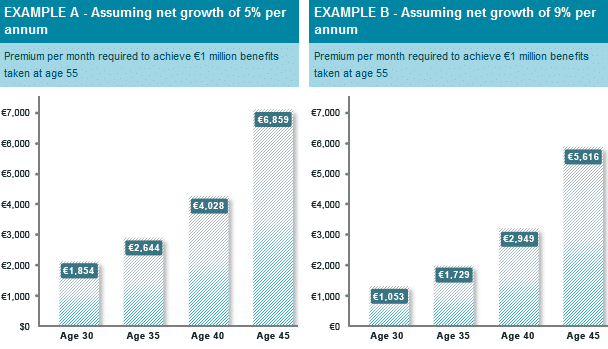 The charts illustrate this point using a pension planning vehicle with an assumed annual net growth rate of 5% (Example A) and 9%† (Example B). There are no set rules for pension planning. However, the sooner you start the better! * The pension plan premium is to be paid for the duration of the policy. † The growth rate shown here is for illustrative purposes and is not based on past performance. The actual return may be different. The rate used is net of an asset management charge of 1.2% per year levied by the insurance company. The assumed gross rate of return is approximately 6.2% in Example A and approximately 10.2% in Example B. Figures are shown below. Past performance of pension plans should not be viewed as an indication of future performance, pension fund prices may go up and down depending upon investment performance and are not guaranteed. You may get back less than you paid in. All pension fund performance quoted is net of annual charges. Please note that securities held within a pension fund may not be denominated in the currency of that fund and, as a result, fund prices may rise and fall purely on account of exchange rate fluctuations. Once you have submitted the form to us, a financial consultant will contact you to discuss your specific retirement needs.